At 27 weeks, my round ligament issues are present but not nearly as bad as last week. I’m getting better at recognizing when I’m gonna hurt them and stopping what I’m doing. And they’re still recovering quickly. So that’s good. I haven’t run since last week, but I’ve been doing low-carb days and KB workouts and that seems to be working in lieu of running. My ribs have been aching this week. The babe is looking for more room! And yes, the babe kicks at least three times after each meal. S/he is well-behaved in that way. Ha! I am getting mildly swollen if I sit for long periods on a hard chair, so I don’t do that anymore. And I’m trying to drink even more water. None of the other typical pregnancy symptoms have changed much throughout my second trimester other than what I’ve mentioned. At 27 weeks, I’m doing pretty well with the transition to more fish and less red meat. I’ve got my 28 weeks blood test for iron coming up and I’m pretty sure I’ll ace it. I’ve been eating a few more carbs this week in preparation for my BG test coming up at my 28 week visit too. This morning, I did another practice BG test and I aced it. So I’m feeling confident for that too. Yay for proper hormone management! I’m still taking my Vitamin D, Fermented Cod Liver Oil/Butter Oil capsules, Enzymes, Probiotics and an occasional dose of prenatal vitamins. A few mornings back, I recorded my resting heart rate. It was 63. That’s a little higher than in the beginning of my pregnancy but still very good. Yay! I didn’t do the actual WOD today. It was all about muscle-ups and pistols – which are really hard for me. Any other preggies have trouble with pistols? They had a Kettlebell Technique class on the calendar and so I took that instead. Everything was unbroken except the side planks and wall squats. My heart rate really went up with the rope undulations, but I had a minute of rest between each round and that helped. I was concerned about doing planks, but Coach Iz had me to wall planks and they were totally possible! I was also concerned about doing planks; but Coach Iz had me do supported planks. This actually was possible too! I found the thrusters rather hard. The rest of the class did turkish get ups instead of the thrusts and lunges that Coach Iz gave me to do. 12 kg was a little heavy for the 1-arm rows but a little light for the swings; but I liked using just the one kettle bell. Within a few minutes after the workout, my heart rate was down to 90. I’m feelin’ good! Thanks to Coach Iz for all the help, encouragement and creativity! This was an amazing class for a preggie! I wish I’d recorded it to share! I was so excited to get a PR! It’s only by 4 seconds, but hey! I’m preggie! I’ll take it! 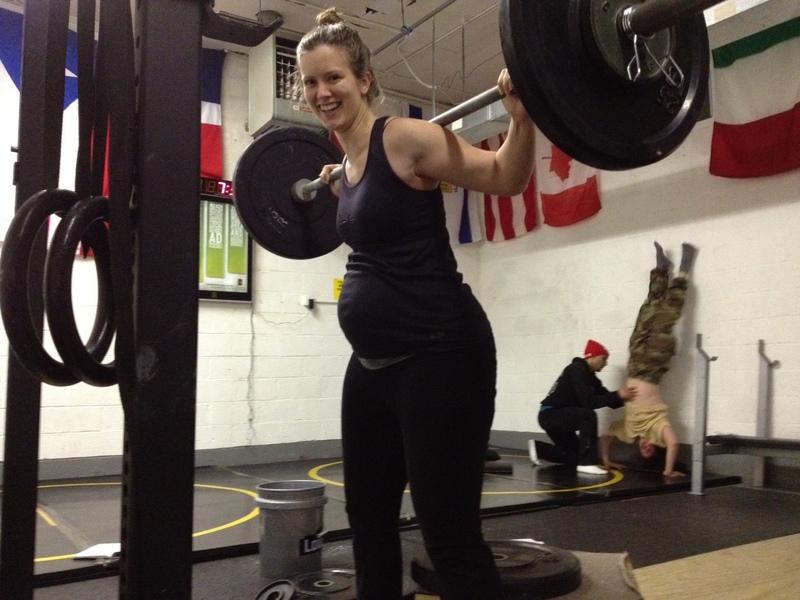 Gillie doing Box Squats at 27 Weeks Preggie! 105 lbs! I had the bar on the power cleans at 45#. I did the versa climber instead of double-unders for the obvious reason. I dare anyone to do 6 min on a versa climber and then attempt 100 air squats. It burns! I stayed home and did a KB workout of my own design. This got my heart rate up and felt good. I tried using the 25# but because it’s a small hand weight, it’s awkward to use for GMs. This was a good little workout that took me approximately 10 minutes. 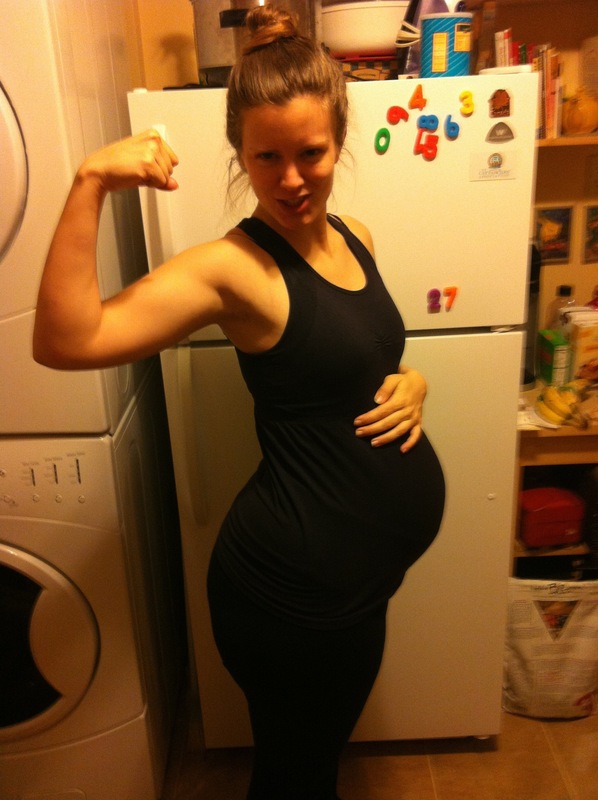 This entry was posted on Monday, January 16th, 2012 at 8:30 am and is filed under preggie. You can follow any responses to this entry through the RSS 2.0 feed. You can leave a response, or trackback from your own site.